4-press blue kiy to save. How to add new Biss keys. the kiy data pressing OK – then Exit -Save -OK – Save again -OK -Exit. to active dongol press 6677 to clossdongol press 7766. Code Activation >>>>>>>>>>Automatically after loading the S/W. and enable Emulation – Red Button to save. GO TO GAME OPION PRAS 19370 & 2486 CODE MENU ACTIVE AND PRS GAME OPION CODE SHOW . 1. Press “EXIT” button & “6108” through RCU (Remote Control Unit), activate **. 2. Then go to Menu Parental Lock Input Password “0000”. 3. 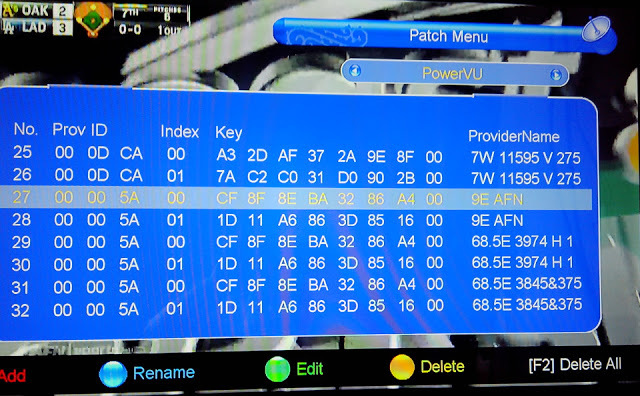 Pay Channel Lock Status has to be “OFF” for the Scrambled Channels to work. 8088” through RCU (Remote Control Unit). press on scren 8899 ok and prevkabuttanlagaobisskiy option agyga. Go to Multimedia Press Ok >>> Then Press 1605 Ok…. Main Menu -> Go To System Setting -> Press 9999 (4Time) Enable Protocol Click On OK Last Option Protocol & Select OSTCAM & Press Ok button. SELECT THE BISS OPTION AND PRESS THE RED BUTTON ON REMOTE FOR ADD NEW BISS KEY . Press Menu Then Press 8888 server Option Open. All New Mp4+HD Receiver’s Model’s Ethernet Protocol Option open Code. Menu>>> press 8888 & Option show in Menu. RED OR YELLOW OR GREEN OR BLUE OPEN ON SCREEN. press menu>Stb Setting>>Press Ok>>Press 9876!.. press > Menu > press remote button 88888 code > Enable Biss option. Press GoTo button on Remote For PoWervU Keys Show.